In “The Most Dangerous Game,” one skilled hunter loaded with resources got his kicks when he hunted someone armed only with his wits. On his weekly conference with reporters when the Senate is in session, U.S. Sen. Sherrod Brown didn’t stay on-topic as he usually does, but led off with comments reacting to Anthem BlueCross BlueShield’s decision to stop selling healthcare policies on the Ohio exchange market, based on “uncertainty” in Washington as Republicans and President Donald Trump seek to repeal and replace the Affordable Car Act (Obamacare). In a statement, Anthem cited “uncertainty” caused by plans to repeal the Affordable Care Act and Trump’s repeated threats to stop Cost Sharing Reduction Payments that reduce out-of-pocket costs for Ohioans buying insurance in the individual market as the reasons for the company’s decision to exit the Ohio exchange. Brown told reporters Wednesday that Trump and a GOP-controlled Congress have created the very uncertainty Anthem latched on to, to stop selling policies in Ohio, a move that is estimated to impact about 70,000 paying customers. Included in his comment on Anthem was a recognition that withdrawing funds to market to new healthcare beneficiaries, especially young, healthy people, hurt the exchange. “If you don’t market it, people don’t sign up,” Brown said. Shortchanging funds to market the exchange didn’t surprise the two-term senator running for a third term next year. What bothers him the most is seeing all his colleagues in Congress get subsidies to help pay for their healthcare access, after watching the Trump Administration “sabotage” health care. Brown’s staff provided a report that 18-20 Ohio counties could be left with no insurer at all in 2018, leaving Ohioans in those counties with no ability to purchase insurance. About 66,000 Ohio customers will lose their current insurance plan: 44,000 on exchange and 22,000 off exchange. The troika of Republican solutions they say is the cure (but which they have yet to devise a medicine to administer) includes a free market, lower costs and increased choices. Brown’s tribe falls behind the ACA, for without it, the so-called free market enabled healthcare costs to skyrocket with fewer choices that were affordable. Health insurance companies created their own standards, based on making maximum profit, that ran up the cost to stay healthy beyond what many could afford to pay. 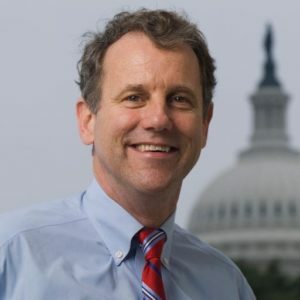 Brown said vocational training has always been important, but because media and politicians generally have college degrees, working in the manufacturing sector, maybe in an apprenticeship program for boilermakers, is talked about as if it’s a second class life choice. Both Brown and Ms. Niki Brafford, whose son participated in one of Brown’s manufacturing camps last year, agreed that vocation training compared to the cost of college produces little if any student debt. Asked if lawsuits brought by Ohio Attorney General Mike DeWine and Dayton Mayor Nan Whaley are the right strategy to take at this time to combat the epidemic of opioid deaths in Ohio, Brown endorsed them. “Everyone has role to lay in combating opioid crisis,” he said, noting the importance of scaling up community treatment centers.